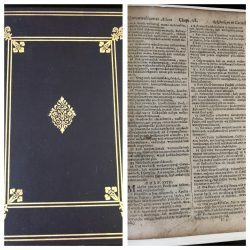 (Leaf Book – Eliot Indian Bible) The First American Bible – A Leaf from a Copy of the Bible Translated into the Indian Language by John Eliot and Printed at Cambridge in New England in the Year 1663. Boston: The Merrymount Press for Charles E. Goodspeed, 1929. Limited to 157 copies. Small octavo, original cloth gilt, with gilded end devices and rule lines. Gilded spine title. 20 pages with an original leaf from the 1663 Bible in Algonquin. Includes an account of the translator and the two printers who produced the book by George Parker Winship. A very good, bright copy. References: Sabin 22154, Darlow & Moule 6737, Doctor. Marrymount Check List – No. 685 issue of the press, Disbound & Dispersed, No. 45.